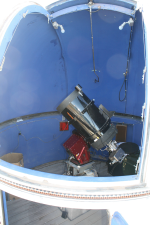 The Shief dome houses the second Celestron C-14 with a SBIG STL 1001E CCD mounted on a Paramount ME. The Shief dome sits just east of the original Etscorn building. The combination of the 14-inch F/11 Schmidt-Cassegrain telescope with the SBIG 1001E CCD gives a plate scale of 1.25 arc seconds/pixel with a field of view of ~21.3 arc minutes. The internal 5 position filter in the STL1001E houses a B, V, R, I and clear filter set. The control room for the roll-off roof enclosure actually houses two control computers. One for each of the Celestron C-14s. In this image the computer and two monitors on right side of the image control roll-off roof C-14 The computer and the two monitors on the left side of the image control the Shief C-14. The electronics rack in the middle holds the ever necessary radio for late night enjoyment. 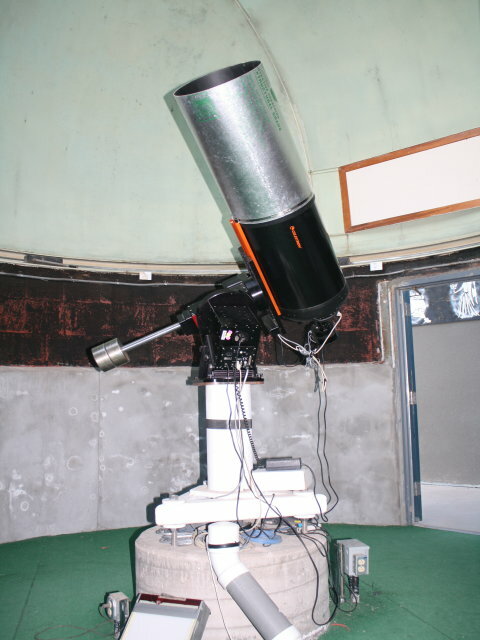 It also has the web cam monitor that shows the position of the telescope with respect to the Shief’s shutter. 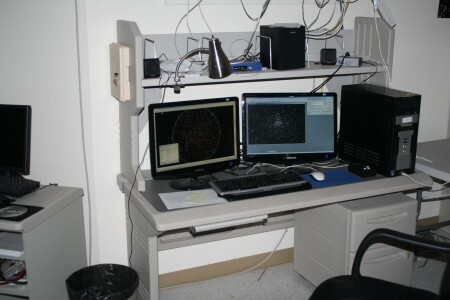 In both systems the monitor on the left side is displaying Software Bisque’s TheSky6 which controls the telescope pointing and tracking. 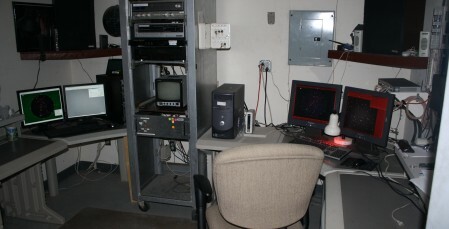 The monitor on the right side has Software Bisque’s CCDSoft V5 which controls the taking and saving of our CCD imagery. The original Etscorn building has a roll-off roof that houses a Celestron C-14 with a SBIG STL 1001E CCD mounted on a Software Bisque Paramount ME. This C-14 has been around for awhile, it is serial number 121!With the roll-off roof we do not have to worry about dome shutter tracking the telescope. This allows for long stretches of unattended observing. The combination of the 14-inch F/11 Schmidt-Cassegrain telescope with the SBIG 1001E CCD gives a plate scale of 1.25 arc-seconds/pixel with a field of view of ~21.3 arc-minutes. The internal 5 position filter in the STL1001E houses a B, V, R, I and clear filter set. This original Etscorn Campus Observatory building houses the roll-off roof, a control room, a battery backup system and storage area. The TAK control center is located in the central portion of the NCLB building. The computer system is the same as those in the Etscorn Control center, a computer and two monitors running Software Bisque’s TheSKy V6 and CCDsoft V5. The CCD attached to the C-14 is a SBIG ST10XME. In order to obtain approximately the same field of view with the other two C-14s we have added an Optec focal reducer. We also have a SIBG high resolution spectrograph that can be use on either the TAK or either of the C-14s. 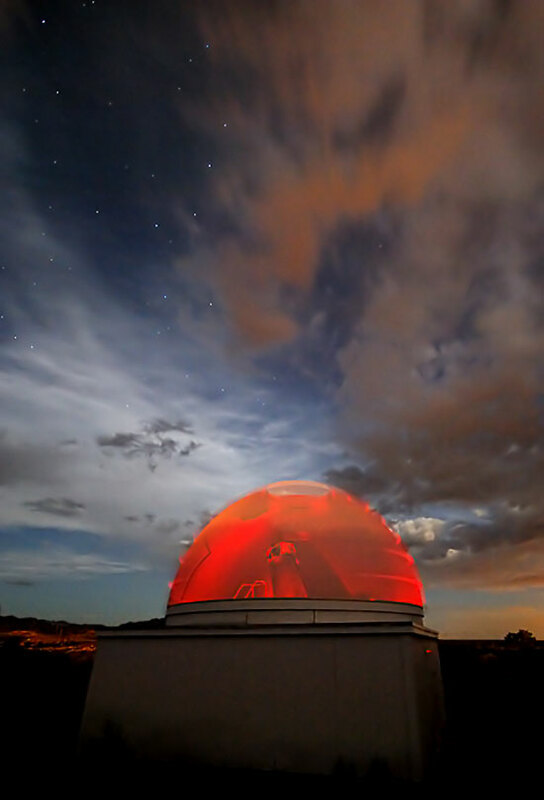 The Celestron C-14 is housed in the large dome that can be seen in the “looking south” image. Combined with the SIBG ST10XME CCD, an Optec focal reducer and the Software Bisque Paramount ME mount, it gives excellent image quality with 1.25 arcsecond pixels and a field of view of 20 x 16 arc minutes. There is an integrated CFW8A filter wheel that has V,B,R,I and clear filters allowing scientific multi color imagery. 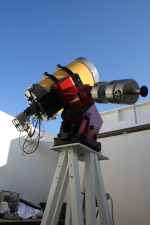 Our flagship visual telescope is a permanently mounted 20-inch Dobsonian telescope in 15-foot diameter dome. 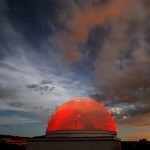 It gives spectacular views of the moon, planets and many, many extended objects. It is used at all of our local star parties. It is made by Tectron, and is mounted on an equatorial platform, so the image of interest will stay in the field of view for many minutes. Can you figure out how Colleen Gino took this picture? The picture was displayed in the Astronomical Picture of the Day for August 21, 2007. The resource room is used for cloudy nights. 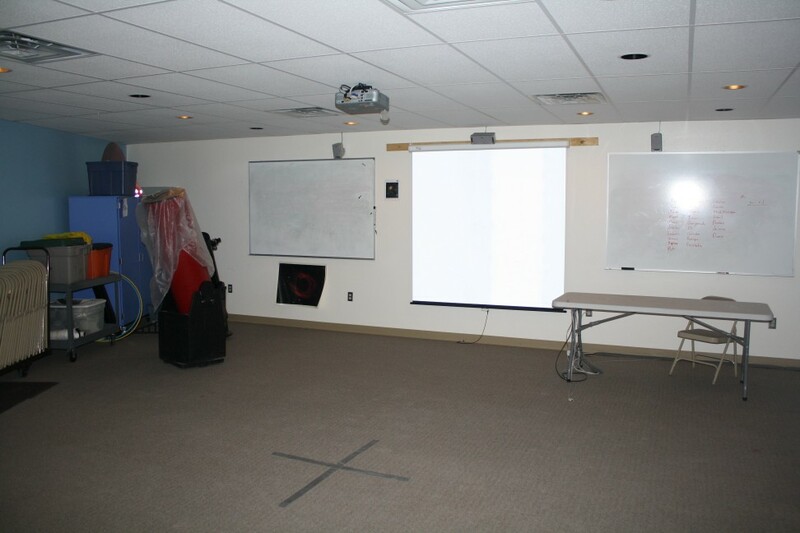 It has complete audio/video system that allows for presentations, movies and internet access. If a group has been scheduled for a star party that is clouded out we have the ability to provide a pleasant and entertaining evening with either lectures or astronomical tours via the internet. The room can hold 30 – 40 people. 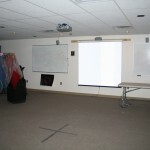 It is also used as a workshop space for teachers, students and the general public.